Maud Palmer Hart was born April 26, 1892, in a house on Center Street, Mankato, Minnesota. (She believed her birthday was April 25 — her legal birthday — until she was an adult.) When she was three months old, her family moved up the street to 333 Center. Her best friend, Frances (“Bick”) Kenney lived in the house across the street with her large Irish-American family. They became friends at Maud’s fifth birthday party and remained friends for life. A third friend soon joined the pair. She was Marjorie (“Midge”) Gerlach and she was from a German-American family. Midge moved with her family back to Milwaukee for several years, but returned to Mankato during high school. Maud always knew she wanted to be a writer and her family strongly supported her. 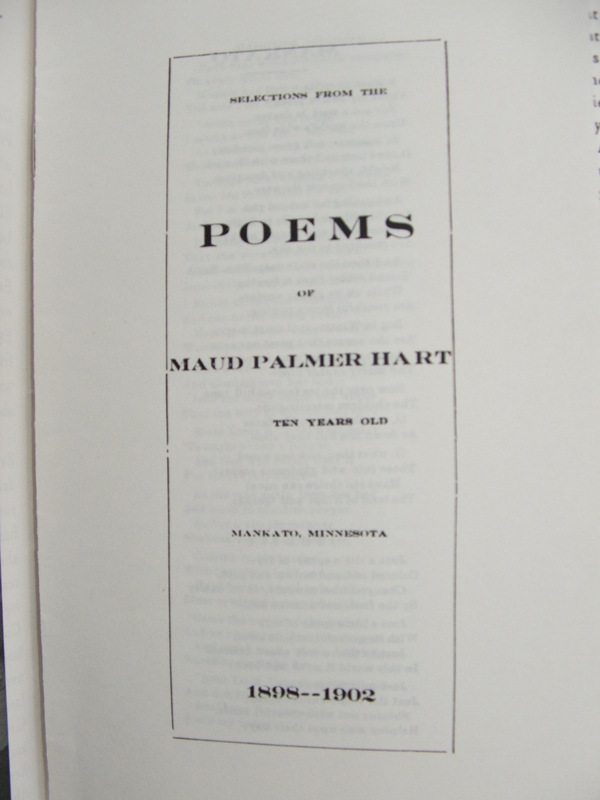 When she was ten years old her parents had a booklet of her poetry printed (see below). Maud attended the University of Minnesota and wrote for the university newspaper. 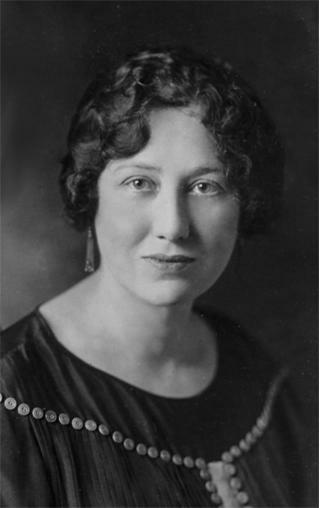 She published her first story at age 18.She traveled to Europe in 1914 and returned after the outbreak of World War I.
Maud then worked for an advertising agency and met her future husband, Delos Lovelace, a newspaperman and writer. They married in 1917 before he left to serve in World War I. The couple lived in Minneapolis and then Greenwich Village, New York, until the birth of their daughter, Merian, in 1931. They moved to a suburb of New York City and Delos commuted to the city for his job as a writer for The Sun newspaper. Both Maud and Delos published fiction in magazines and novels. Maud’s most celebrated novel was Early Candlelight, set at Fort Snelling, Minnesota. Maud and Delos co-wrote a novel, Gentlemen from England, and a children’s book, The Golden Wedge. They also edited each other’s writing. Delos wrote sports scenes in the Betsy-Tacy books. Like Laura Ingalls Wilder’s Little House series, the Betsy-Tacy books are based on the author’s life. Unlike Wilder, Maud chose to change the names and some of her characters, per editor request, combine two or more real people. Sharla Whalen researched the real people behind the book characters for ten years. Her work culminated in The Betsy-Tacy Companion, published in 1995. It includes photographs and charts of the real people and the book characters. The descendants of the people represented in the books have taken part in Betsy-Tacy Conventions held in Mankato, Minnesota. In particular, six of Frances Kinney’s grandchildren attended the 2002 convention. Kinney’s great-great-granddaughter is named Tacy. 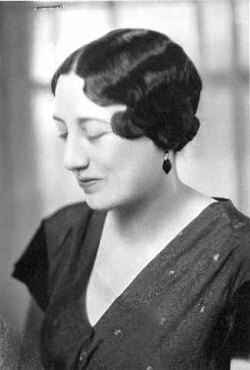 Louise King, the daughter of Marney Willard (Carney Sibley in the later books), lives in Minneapolis and attends many Betsy-Tacy events. There are a total of ten Betsy-Tacy books and three satellite books that include the Betsy character. Maud and Delos Lovelace retired in 1953 to Claremont, California. Delos, Maud’s husband, died in 1967 and his ashes were spread over the Pacific Ocean. Maud died in California on March 11, 1980 at the age of 88. Midge had died in 1964 and Bick in 1969. A Betsy-Tacy fan who visited her at her retirement home in 1979 said that she spoke at length about how she had lost every person close to her except her daughter. Maud’s ashes are buried with a monument at Glenwood Cemetery, Mankato, Minnesota. 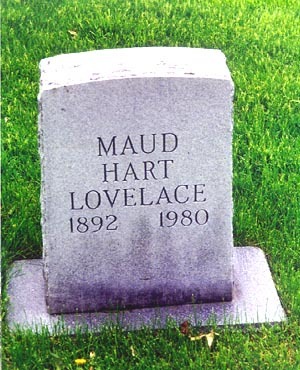 There is a newer marker provided by the Maud Hart Lovelace Society that includes the names of her books. Merian Lovelace Kirchner attended the first Betsy-Tacy Convention held in Mankato in 1992. She wrote a regular column for the Betsy-Tacy Society Journal. She died in 1997. Merian had one first cousin (Eugene Foster) and she left many of her mother’s possessions to the Betsy-Tacy Society. Her mother’s papers are stored in Greenwich Village until a permanent home is chosen. Sharla Scanlan Whalen. The Betsy-Tacy Companion. Portalington Press, 1995. 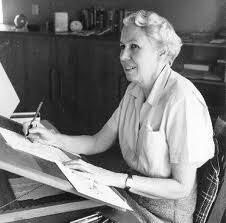 Lois Lenski was born October 14, 1893, in Springfield, Ohio. Her father was a Lutheran clergyman and she was one of five children. She graduated from the Ohio State University with a teaching degree. She had taken many art and drawing classes at the university and chose to move to New York City to attend the Art Students League. She traveled to London and Italy in 1920 and married Arthur Covey, another artist, soon after she returned. She was stepmother to his two children and they had a son together. They lived on a farm in Connecticut and later in Florida. Lenski illustrated the Betsy-Tacy books early in her career. She later decided to write and illustrate her own books. She eventually illustrated about 50 books by other authors and 100 of her own. Her first book was Skipping Village and Strawberry Girl won the Newbery Medal in 1946. She wrote books for various series: Regional (set in various parts of the United States), Mr. Small, Davy and Roundabout. Lois Lenski’s work has received numerous accolades. In addition to the Newbery Medal, her books Phebe Fairchild and Indian Captive were Newbery Honor Books. Lenski died in September 1974 at age 80.